Keep reading to learn what 4K is and what you need to enjoy 4K streaming content. What Does 4K UHD Mean? 4K UHD refers to display resolution (the number of pixels a screen can handle), and UHD stands for Ultra High Definition. 4K is roughly four times the typical 1080p screen, delivering a high resolution image that showcases the tiniest details of your favorite movie or TV show. The minimum speed you need to stream 4K content is 25 Mbps. Why? Because all those extra pixels that create the detailed, sharper image require additional bandwidth. An Internet connection is only one part of streaming 4K content. The other part is having a 4K streaming device, like a smart TV. A number of services stream 4K movies and TV shows online, each with certain minimum requirements. Click on service to see what you need for 4K streaming. 4K streaming options on Netflix continue to increase, especially as the platform continues to produce original content. While most of this original content is available to stream in 4K, other movies and TV shows in 4K vary from month to month. You can stream, rent, or purchase 4K content from Amazon with Amazon Instant Video. Its collection of 4K movies to rent or stream varies from month to month, and its original series are always available in 4K. YouTube® is arguably one of the best sources for 4K streaming, thanks to its user base and the number of 4K cameras on the market. You may not find feature-length movies in 4K, but you’ll be treated to amazing video clips, nature videos, even high-flying stunts. If you own select models of Samsung 4K TVs with VIDITY-enabled storage devices, you can download 4K content from Fandago®. Otherwise, you can rent or purchase 4K movies to stream from Fandango. You can rent or purchase movies from Vudu® and its growing 4K video streaming library. Ultraflix® claims to host the largest collection of 4K content to rent for 48 hours at a time. You’ll find documentaries and concerts in addition to dramas, sci-fi, action, and comedies. The Google® Play Store has more than Android apps! With Google Play Movies & TV, you can rent or purchase 4K movies online. To find 4K content available through Google Play Movies & TV, simply search for “UHD” in the Google Play Store. 4K movies and TV shows are available on the iTunes Store to rent or own, and will play in the highest-quality format your device can handle. If you want to find specific 4K content, look for the 4K icon on the product page. Find 4K movies and TV shows on your favorite device. Just click the name of your 4K streaming device to learn how to find 4K content. Roku comes in two varieties: a streaming player or a TV. If you don’t have a smart TV, you can get a Roku streaming player, like the Roku Express or the Roku Ultra. These devices connect to your TV through an HDMI cable and the Internet via wireless, giving you access to streaming services like Netflix, Amazon Prime, and Hulu. With a Roku account, you can access 4K streaming content from those services as well as Roku’s dedicated 4K streaming channel. 2nd and 3rd generations of Amazon Fire TV support 4K streaming. If you have a 4K-compatible TV, Amazon automatically displays the 4K content available. And with Amazon Fire TV, not only do you get access to Amazon’s 4K library, but also those of other streaming services like Netflix and Hulu. Google Chromecast plugs directly into an HDMI port on the back of your TV. Some setup is required through chromecast.com/setup, but once you connect it to your home WiFi network and download the Google Home app on your phone, you’re good to go. Sony® PlayStation® can also be used to stream 4K content. Game in 4K already? Perfect. Now you can watch your favorite movies in 4K too. Just go to the PlayStation Store, search and download your favorite streaming apps, like Netflix, Hulu, Amazon Prime, YouTube, and more, login with your streaming app credentials, and start streaming 4K content. Microsoft Xbox is more than a gaming console. The same Internet connection you use for online gaming allows you to stream 4K content, too. You can use your Xbox to stream 4K movies online by downloading your favorite streaming apps and logging in with your credentials. Nvidia is best known for its GPUs, gaming displays, and gaming rigs. The Nvidia Shield TV brings its high-tech gaming perfection to your TV. Stream 4K movies online from Netflix, Hulu, Amazon Prime, and more in stunning 4K, the way they’re meant to be seen. 4K Ultra HD isn’t limited to streaming services. WIth a DISH® TV subscription, a Hopper™ 3, and 4K Joey, you can watch movies, TV shows, sports, and more in 4K Ultra HD. Plus, DISH’s on-demand library has 4K content, too, so you’ll always be able to find something to watch. Want to see the latest Netflix original programming in 4K? No problem! 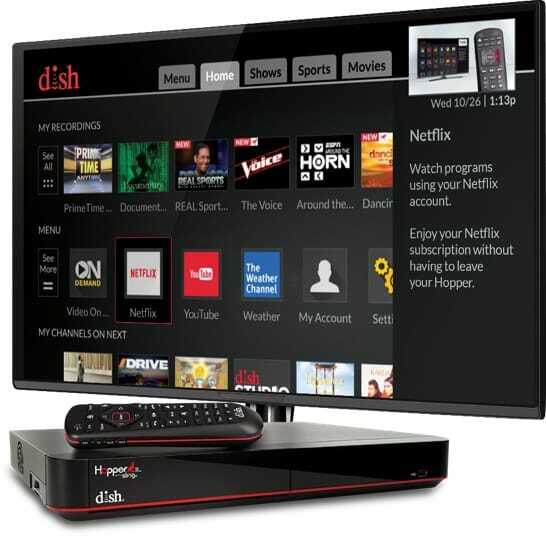 With the DISH Hopper, you can switch to Netflix with the click of a button, and start watching without having to switch inputs, consoles, and remotes. See what else DISH has to offer!